BIZZTTOR India organised a networking event – Bizztor Connect-Delhi NCR at Spaces, Guragaon. Bizztor is a community of entrepreneurs, Investors and Industry experts to help entrepreneurs to help them create the next big startup. The participants were majorly aspiring entrepreneurs with most of them having an operational model already in place. 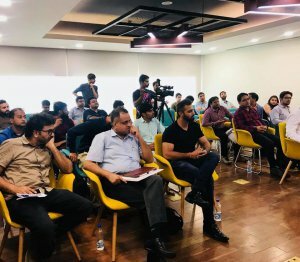 Apart from these entrepreneurs sharing their experiences, the event was also consisted of speaker sessions by experts of the Ecosystem. Aveloy Roy from Kolkatta Ventures touched on roadmap to create a multi-million Startup and shared his entrepreneurial experiences. Anil Chikkara, a Startup Coach shared his take on understanding the Early Stage Investors Psychology. Espark-Viridian & Knowlarity as Bizztor partners also participated in the event to interact with the participants. Espark-Viridian Team conducted a Partner session giving awareness of how we engage with the early and scale-up stage startups and shared some of the success stories. The event ended up with a Power networking segment wherein Espark-Viridian Team interacted with the entrepreneurs, answering their queries.